Breakfast is the most important meal of the day, and sometimes that’s all the more reason to eat dessert first. After all, what will make you smile after a rough night’s sleep more: a pallid jar of slimy overnight oats or an order of warm and fragrant McDonald’s cinnamon-sugar doughnut sticks to dunk in your extra-large coffee? McDonald’s has announced that beginning Feb. 20, hungry customers will be able to order the freshly made doughnut sticks in the morning (they won’t be available outside of breakfast service). They’re prepared on site, never microwaved and served hot. Each one is a golden stick of fried dough that’s tender on the inside, crispy outside and rolled in cinnamon and sugar before serving. Basically, they’re breakfast churros, and we have no shame about the fact that we’re going to burn rubber on our way to the drive-thru the very morning they’re first available. Doughnut sticks will be available by the dozen or half-dozen, or you can bundle a half-dozen with your McCafé coffee for a special price. We've got Nacho Fries from Taco Bell. Funnel Cake fries from Burger King. Donut Fries from Dunkin. 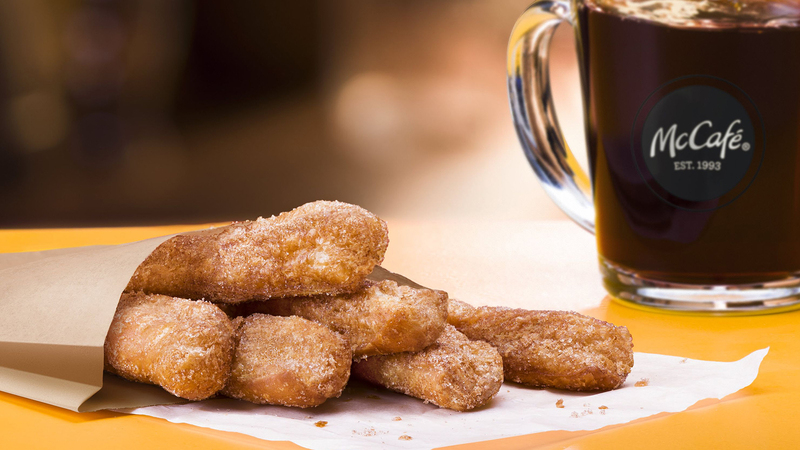 Now, @McDonalds is jumping in the game with Donut Sticks, starting Feb. 20. The doughnut sticks, which will only be available for a limited time, were tested and perfected at McDonald’s restaurants in Illinois during 2018. The chain went back and forth between different doughs, shapes and amounts of cinnamon-sugar topping before settling on the perfect doughnut stick to share with customers nationwide. McDonald’s isn’t the only chain experimenting with delightful fried pastries. Burger King relaunched their funnel cake fries this January, Dunkin’ has been serving up croissant-inspired, cinnamon-dusted doughnut fries, and Taco Bell has offered both crunchy cinnamon twists and icing-filled Cinnabon Delights on their menu. This is one trend we can definitely get behind. Whether you’re getting them as a post-Valentine’s Day sweet for your sweetie or just trying to coax yourself into becoming a morning person by way of fried bread and sugar, you can pick up an order of McCafé doughnut sticks at participating McDonald’s restaurants at breakfast starting Feb. 20.